What is the draw of magic in stories? Why does it attract us? What does it say about the human condition that no matter who or where we are in this world, we so love a story with magicians and witches, elves, dwarves, and various monsters causing mayhem? Magic is the potential of dreams and desires. We wish for our heart’s desire as we blow out candles and after a successful hunt for a four-leaf clover. No matter how much or how little we have, we wish for more. More of whatever we feel a lack of in our lives. Prettier looks, money, success, and, of course, love. We wish pain would go away and that our enemies will suffer. Because we wish, our minds are open to stories of magic. We are well-prepared to suspend disbelief and enter worlds where wizards walk and witches sing and dance around cauldrons. A good many of us desire interaction with fantasy worlds so much we dress up, plaster our surroundings with symbols, and memorize words of power. From our birth, when wishes and prayers for a long and healthy life rain over us, to the first time we are instructed to make a wish, the longing for magical or divine intervention is ingrained into our psyche. It is no surprise then that as we grow we are often transfixed by stories where people are helped by magic-bearers and secret wishes are granted by faeries. Our life, physically and emotionally soars and dips. Having magical stories to escape to helps us cope with change and tension – even if only to distract us and give our minds a rest. The magic used in Keeper of the Way is from a time when magic was everyday, concocted over the kitchen hearth, and used for the well-being of all. Rosalie Ponsonby and her friends use beans on their runners, honey fresh from a hive, bread baked with fine-ground flour, and specially prepared herbal teas. This is hidden magic – where the ordinary can be used to create something extraordinary. Black salt (salt mixed with ash) and lavender is used as protections from evil. Lemons are cut and left by doorways and windows. We may think of these as “old wives tales” today, but this is merely another way of hiding magic. Sigil-craft is also used – the manipulation of written words to request a blessing or boon from the Spirits. The women start with Chaos-magic – simplified spells using the quickest means and easiest tools (pencil and paper) and will work their way toward intricate designs with ink and air and mist as their ability grows. Their tools also become more assertive; from pencils to craft basic sigils and a wooden spoon to stir their cauldrons to swords, daggers, and wands. But we also require balance and we can’t have good without some bad. We wish and wish, and are told to be careful what we wish for – we must think about the things we are asking for or the wish outcomes may not be as we expect. Faeries are ever ready to play tricks on us. Magicians, wizards, and witches may not be as they seem, and monsters lurk in every dark crevice of the mind. The antagonists in Keeper of the Way, Algernon and Clement Benedict use blood sacrifice and dark rites to align themselves with malignant spirits. They misuse tools of power to infect malicious energy into the home and sanctuary of Rosalie and her family, and are prepared to commit murder to further their own needs. They have stolen relics guarded by the MacKinnon Clan for millennia and corrupted their purpose, deliberately opposing the morality of the Ponsonby family, their friends, and their ancestral spirits. Fairytales of our youth drip with warnings, symbols, and moral lessons. Often these lessons have helped shape our moral compass without us realising. In Keeper of the Way and throughout the Crossing the Line series, we will see how easily this compass can be disrupted as the Benedict men continue to act in opposition to the beliefs they profess to. If you’ve grown up on a steady diet of speculative fiction, everything from fables and fairytales to Lord of the Rings-style high fantasy, and Harry Potter-esque teenage adventures then you’ll be ready to believe in magic everywhere you see or hear of something otherwise unexplainable. Even in the kitchen pantry. Myths become truths waiting to be proven. Mysteries are doorways between the natural and supernatural worlds. And monsters lurk in the shadows waiting for mayhem to descend. 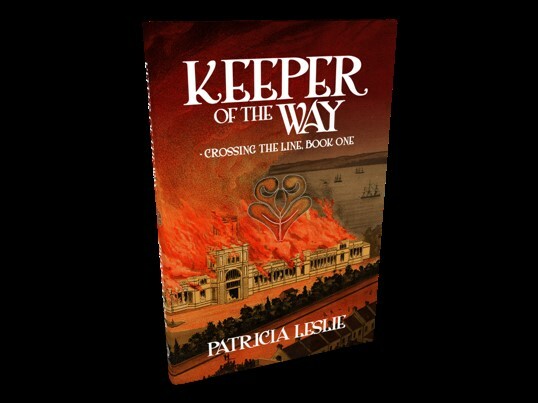 Keeper of the Way is the first book in the Crossing the Line series. Patricia’s books can be purchased via all the usual places online or ask for it at your favourite bookstore. After news of grave robbing and murder in Dun Ringall, the ancient stronghold of Clan MacKinnon on the Isle of Skye, Rosalie realises it is time to share her family’s secrets. Descendants of the mystical Ethne M’Kynnon, Rosalie tells of a violent rift that occurred centuries earlier, splitting Ethne from her sisters forever and causing relentless anguish and enmity between ancient families. Meanwhile, Algernon and Clement Benedict have arrived in Sydney searching for the lost relics of their family. They are driven by revenge and a thirst for power, and will take what they can to reinstate their family heritage. Their meddling with ancient magic will have far-reaching effects, as they fail to realise their role in a far greater quest. In the grounds of Sydney’s magnificent Garden Palace, danger grows as an ages-old feud of queens and goddesses heats up. The discovery of arcane symbols bring the distant past in a foreign land to Australia and will cause a profound struggle with tragic results, a surprising new recruit from an unknown world, and the complete destruction of the palace. Set around stories and characters in 1882 Sydney, Keeper of the Way includes current affairs, people and buildings long gone, and gives a voice to people history doesn’t always listen to. Keeper of the Way is published by Odyssey Books. Patricia Leslie is an Australian author with a passion for combining history, fantasy, and action into stories that nudge at the boundaries of reality.